Good: Sharp photography, strong rookie checklist, solid value. Bad: Jersey cards don't add much excitement, some insert designs better than others. The Bottom Line: Outside of Topps Baseball, few sets are collected as passionately as Upper Deck Hockey. There are plenty of reasons why. Ever year collectors can count on a solid design, some of the best photography in the hobby and plenty of Young Guns rookie cards. 2011-12 Upper Deck Series 1 Hockey hits all these benchmarks. It's another strong release that's worthy of the annual hype. Once again, Upper Deck's base hockey set is a showcase for great action photography. A lot of sports cards designs rely on the same angles and poses for the majority of their pictures. 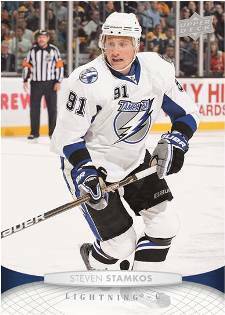 Although 2011-12 Upper Deck Hockey has its share of skaters in mid-stride, there are also lots of different sorts of snapshots. Netcam and pre-game entrances are both popular. There are also lots of candid moments that give the overall feel of card fronts a fresh feel. Pinnacle is one of the few sets Upper Deck has competition with in this department. Card backs offer both full stats and a second photo, which comes in the form of a tightly cropped face shot. Some players also have short bios if they've had short careers. Nicklas Lidstrom fans may want to consider a magnifying glass. Basic inserts are a bit of a mixed bag. The canvas-like card stock give the UD Canvas cards a very unique feel to them. 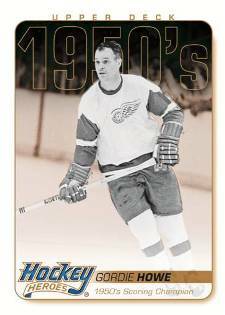 Also strong are the subtle orange highlights that compliment the black and white photos on the Hockey Heroes cards, which honor players from the 1950s. Unfortunately the All-World Team cards don't really add anything to the set. The EA Sports Ultimate Team cards look more like something from the mid-90s SkyBox NHL on Fox sets, both in their look and corporate connections. Let's be honest - a lot of collectors chase Upper Deck Hockey for the Young Guns rookie cards. Finding the sweet spot between attainable rarity and strong secondary market value, the ultimate long-term success or failure of a base Upper Deck set can be correlated with its rookie crop. Thankfully, the NHL helps this with their clear and easy-to-follow rules for rookie cards. 2011-12 Upper Deck Series 1 Hockey is led by Ryan Nugent-Hopkins and Gabriel Landeskog. But collectors shouldn't discount several of the second tier rookies. While they may not reach huge values, there's still nothing wrong with pulling a rookie that's worth $10-$20. This set benefited from not being released super-early in the season. This gave Upper Deck enough time to include several of the debuting rookies. The base set also covers the majority of the NHL's stars, leaving just enough for Series 2. 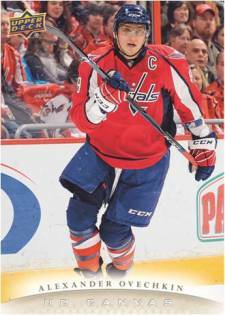 With both Series 1 and Series 2 combined, the 2011-12 Upper Deck Hockey checklist is extremely comprehensive. You'd be hard-pressed to find a base set with more consistent value than Upper Deck Hockey. A huge part of that is because of the Young Guns, which are always popular with player, team and set collectors. Upper Deck has also included a variety of tough-to-pull autographs and some interesting case hits to further fuel the chase. At this point, the jersey cards do very little for me. I'd much rather see the two generic hits scrapped for a more creative insert that uses some cool technology. There's enough value built into the base set that the jersey cards aren't needed to sell the product. 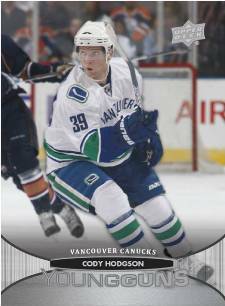 From the Young Guns chase to the crisp photography, I had a lot of fun with 2011-12 Upper Deck Series 1 Hockey. The cards are a lot of fun to pour over and study. While I didn't land a Landeskog or a Nugent-Hopkins rookie, it was still satisfying coming close to a base set and a solid start on the short prints. 11 12 UD Series 1 Gabriel Landeskog Young Guns Rookie #208! Colorado Avalanche! 2011-12 UD Series 1 Craig Smith Young Guns Rookie Graded BGS 9.5, Gem Mint. 2011 12 UD Series 1 Young Guns Rookie Cards U-Pick + FREE COMBINED SHIPPING! For more than two decades, Upper Deck Hockey has been one of the cornerstone sets for hockey card collectors. Mixing sharp photography with a deep checklist of short-printed Young Guns rookie cards, Upper Deck Hockey is to ice what Topps Baseball is to the diamond. 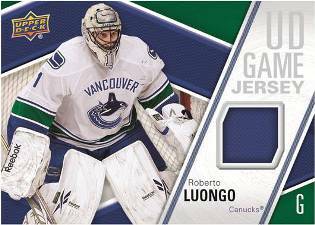 Besides one of the most collectible base sets in the entire sports card hobby, 2011-12 Upper Deck Series 1 Hockey has several different levels of inserts including two game-used jersey cards per box. Don't expect a lot of autographs, though, as they fall only one per case. Young Guns short printed rookie cards (1:4) return once again. UD Canvas (120 cards, 1:4 packs) will prove to be a moderate challenge to put together. Thirty UD Canvas Young Guns fall at a rate of six per case. UD Game Jerseys (1:12) provide the game-used memorabilia content. EA Ultimate Team (1:24) connects collectors and with the popular video game franchise. Hockey Heroes 1950's gives a reboot and new design to the long-time insert set. All-World Team (1:12) showcase the international reach of the game. 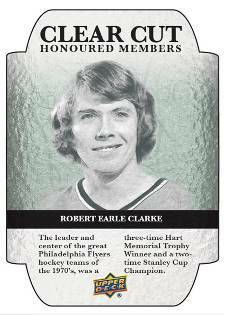 Clear Cut Honoured Members printed on acetate. Inserted one per case. Signature Sensations provide the only standalone autographs in the release and fall one per case. Always a solid release for every collector young and old. I love the young gun chase every year. Bought a hobby box and pulled a Hodgson & Scheifele young guns, no case hits and crappy jerseys but for Christmas i received a retail box as a small present and pulled a RNH oversized young gun, 2 scrub young guns and a Ryan Miller Jersey. I was happy just hitting the oversized young gun. No set can match the amazing photography that goes into Upper Deck Series 1 & 2, I actually look at the base cards. I’m an auto & patch lover so i don’t ever go into this release with high hopes of a white whale but every once and a while something pops up that surprises you in this. For typically under $100 you get 6 rookies and 2 jerseys at least so it’s a yearly must, at least 4 or 5 times. amazing product, great set just completed the All World Team, base set, clear cut honoured, EA ultimate Team, Hockey Heroes, Winter Classic O/S and the young guns I’m trying to complete the clear cut foundations but thats proving a problem but I’m sure I’ll get there. Amazing photography, but my favorite cards are the clear cut Honoured and Foundations.